My cousin Stephanie came out to visit with Justine and I for a few days last week. 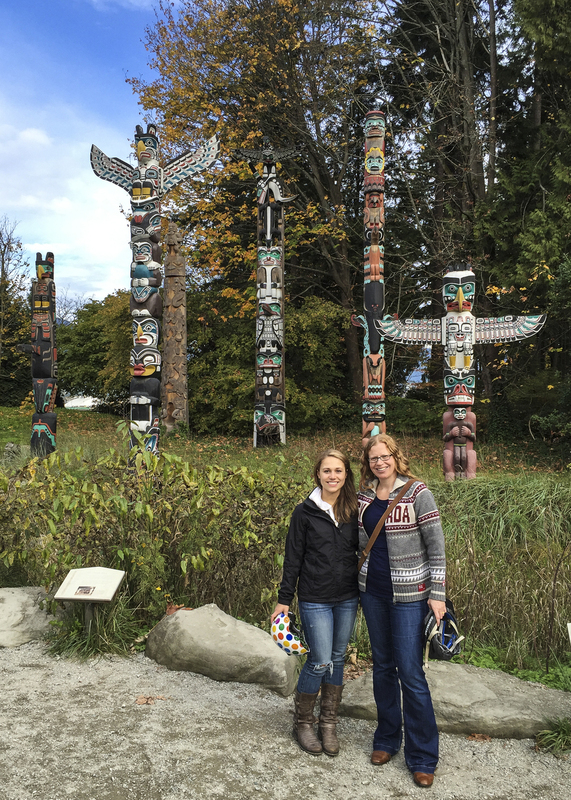 It was her first time in Vancouver (visiting from Ontario), and it was a lot of fun to show her the sites. 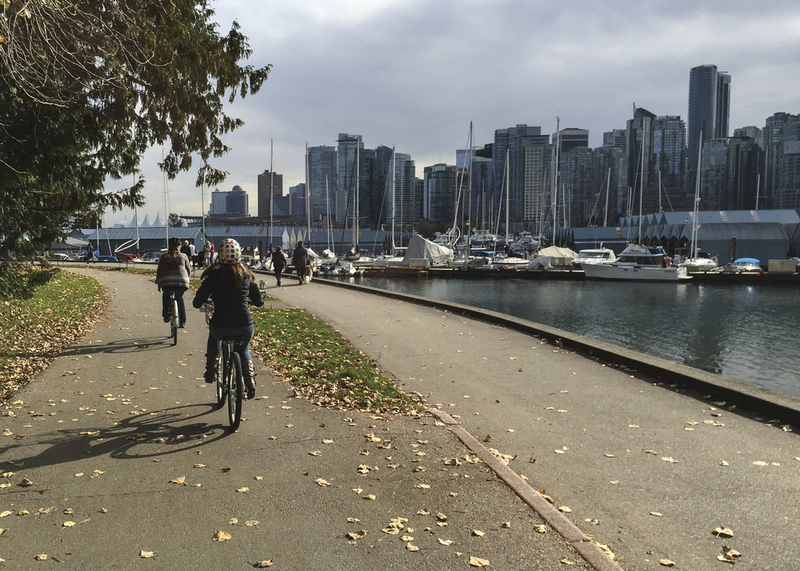 We had amazing weather (for late October), so she got to see the best of Vancouver. Stephanie arrived about 8:30 on Saturday evening, after the long flight from Toronto. She was feeling pretty good (or at least she said she was...) so we headed out to find some food (seems Air Canada wasn't willing to feed her on the flight...), and headed over to Olympic Village. It was about a 30 minute wait to get into Craft, one of our favourite spots, so we wandered for a bit, showing her some of the sights. Once our table was ready we had some food, a few local beers then called it a night. A map of our bike ride along the sea wall. Click for a larger version. Sunday we had a fair bit planned, and were blessed with an amazing day. I had hockey in the morning, so Justine and Stephanie wandered over to explore the market at Granville Island, and to get some breakfast. Not wanting to let it go to waste, we rented Stephanie a bike, and headed out to do a bit of a tour of the city along the sea wall. We started out near Granville Island, then headed out east towards Science World, around False Creek and out towards Stanley Park along English Bay. We did a full lap of Stanley Park before heading back home. Justine and Stephanie riding under the Lion's Gate Bridge. We had to have the bike back by 3:00, as we had tickets to the Whitecaps last home regular season match of the year. While the team had secured a playoff spot, the results of the game (plus the others being played on the last day) meant that the team could reach as high as 2nd or as low as 6th. It was a big game! And an awesome game, as it turned out. All the results went the way we needed, and after pulling off a very exciting 3-0 victory, the Whitecaps ended up in 2nd place with a first round bye. The game was a lot of fun, and we went out for drinks and food after the game at a new place in Olympic Village. Our hike up the Grouse Grind. On Monday, it was my last week of work with MDA. I didn't have a lot that I was needing to wrap up, so I took the afternoon off, to hang with Stephanie. We decided to head up to North Vancouver and do the hike up to the top of the Grouse Grind. We had a pretty nice day - it wasn't raining, and the clouds looked like they were breaking up. Stephanie did great on the way up for a first timer, clocking in a just over an hour. Very respectable. The promise of beer and nachos at the top seemed to spur her on a bit. After relaxing and recovering, we did a bit of a wander around the attractions at the top. The clouds came back in, and everything was in a bit of a weird foggy state. But the bears were out, and quite close to the fences which made for a good show. One of the big grizzly bears in the enclosure at the top of Grouse Mountain. And his slightly smaller friend. There were even some deer wandering about, not really that afraid of anyone. We came back down and took a quick drive over to Lynn Canyon, to show Stephanie the suspension bridge. After that, we headed home and spent a pretty relaxed evening playing Settlers of Catan, which was good fun! The view down from the Lynn Canyon Suspension Bridge. I took Tuesday off, as it was Stephanie's last day with us. We had another nice one, so I thought it would be worth taking a drive up to Squamish, to do the new Sea to Sky Gondola. I still hadn't been up it either, and from what Justine had told me, it was pretty spectacular. The base of the Sea to Sky Gondola, looking up to the first part of the mountain. 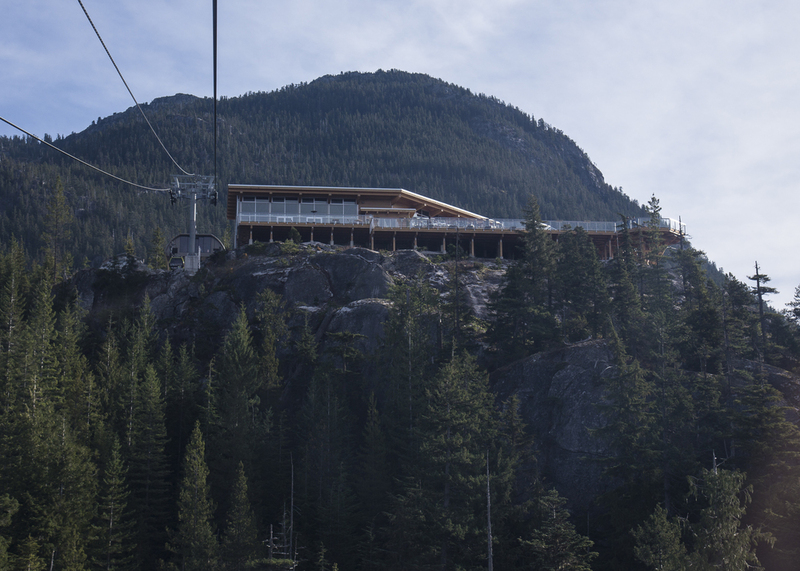 The Sea to Sky Gondola is a new attraction near Squamish that takes you up over the Chief, and into the backcountry. They've built a whole series of trails, a suspension bridge and a great chalet up in a part of the country that was previously really hard to get to. Stephanie and I did a bit of hiking at the top, and were able to check out the two short trails that lead to some really great views over Howe Sound, Squamish and the Chief. We had a really nice day, and some great views of the surrounding area. As Stephanie had never been up this way, I think it was good exposure to how amazing this part of the country is. Looking back down, as we head up the gondola. Stephanie on the suspension bridge. The chalet and the suspension bridge. 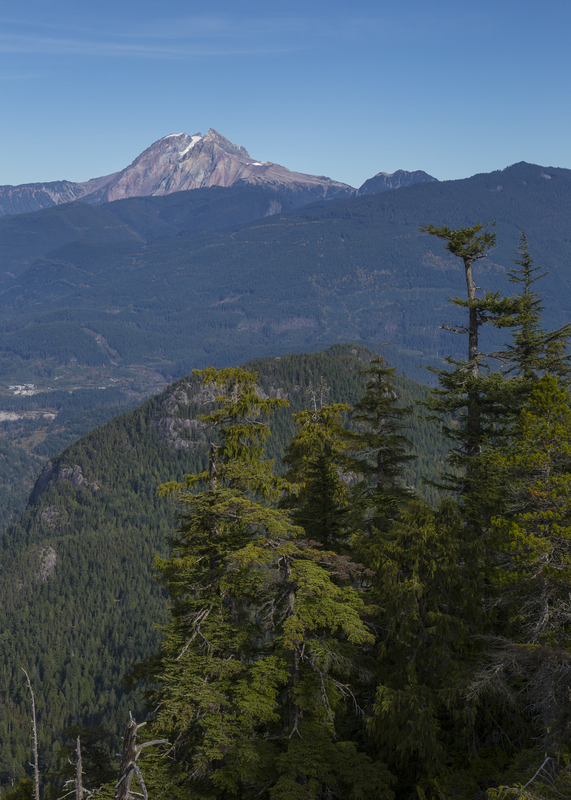 One of the lookouts, with a view down to the Chief and Squamish. The chalet, with mountains looming in the background. Since we were already halfway there, we decided to drive up to Whistler so Stephanie could see the Village. As it's the complete off season - no skiing, no biking - the place was pretty dead. Still there was some nice colour, and it's always nice to stroll through the Village. The last of the fall colours at Whistler. Wednesday morning I took Stephanie to the airport before heading into the office. It was nice having her with us, and I hope a few more people come out to see us!